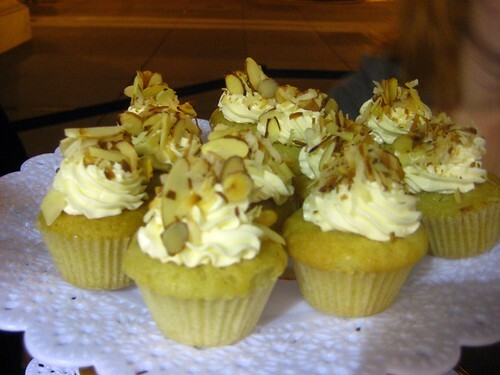 Blondie and Brownie: Travels with Blondie: The Foodie Gathering in San Francisco!! Travels with Blondie: The Foodie Gathering in San Francisco!! Two Thursdays ago, I touched down all the way across the country in beautiful San Francisco. I was excited to explore the city, while also looking forward to the First Annual Foodbuzz Food Blogger Festival!! Street food, generous booze, an Outstanding in the Field, it looked to be an awesome weekend of eating. I'm still recovering from the food overdose. 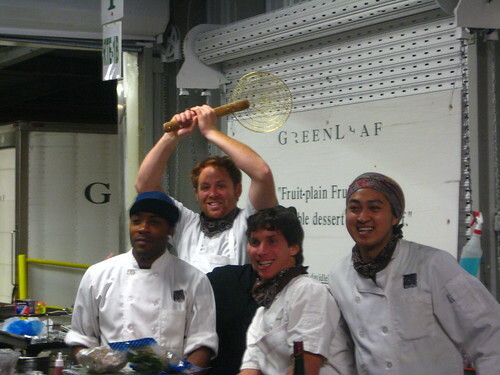 Of the food from Foodbuzz, I have to say my favorite item (and I think Zach's too, since he ate some off my plate!) 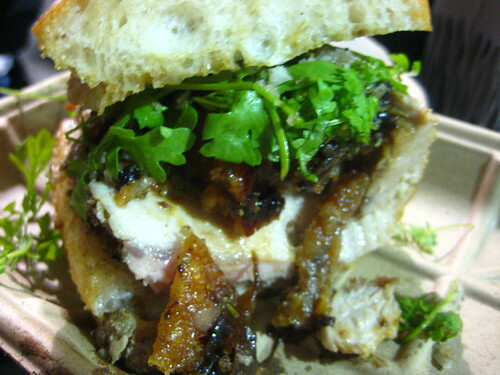 was the pork sandwich from Roli Roti from Friday Night's Street Food Fare in the Ferry Building. Oh yeah, a food truck with a spit, or "a gourmet mobile rotisserie." Crispy skin, tender pork, great seasoning, there was open wondering on why we can't get this off a truck in New York. Because if we did, it would be AWESOME! 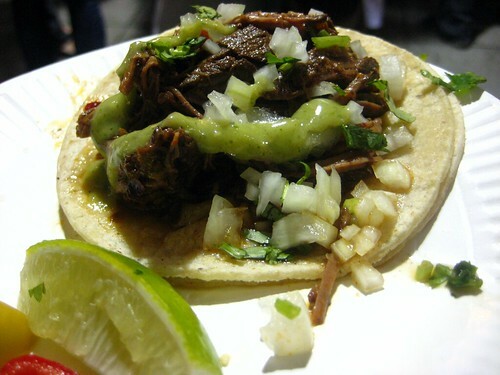 Another highlight of that night was the braised beef taco from Tacolicious. Tender and moist, we need more good Mexican in this town, preferably off carts!!! On the dessert side, I got my first taste of Mission Minis that night. Over the weekend, I managed to try every flavor, my favorite being the Swiss Almond Coconut. Not too sweet, exceptionally moist for a mini cupcake, and no flavor overwhelmed the other. And I was blown away by some of the creamiest, flavorful ice cream I'd had in a long time. 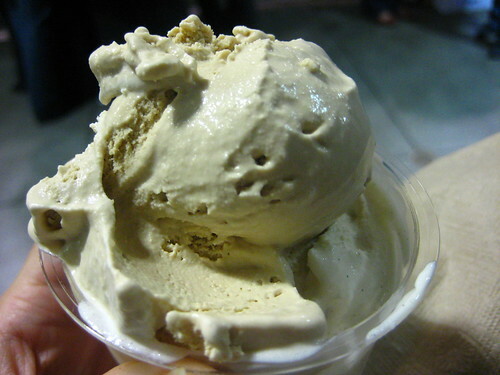 It was from Straus Family Creamery; they offered their vanilla bean and their coffee. Both were the perfect temperature, the right amount of flavoring, no icy bites, I can't wait to have more. 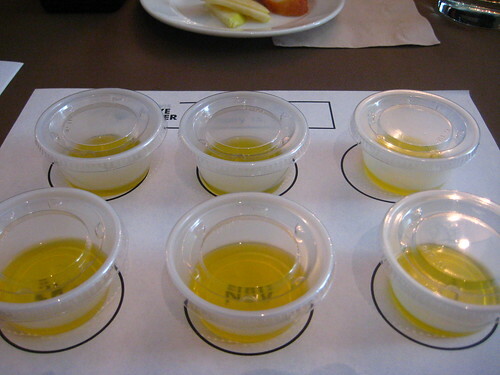 On Saturday, I participated in an olive oil tasting instructed by Michael Tuohy, the chef from Grange in Sacramento. He is a wonderful teacher, funny, informative, and understood that not everyone sips olive oil on a daily basis. It really is like tasting wine, and gave me a new stance on olive oil. Also on Saturday was my first chance to try Outstanding in the Field during the Awards Dinner. Though the cooks tried with their really makeshift kitchen, not everything went off without a hitch. 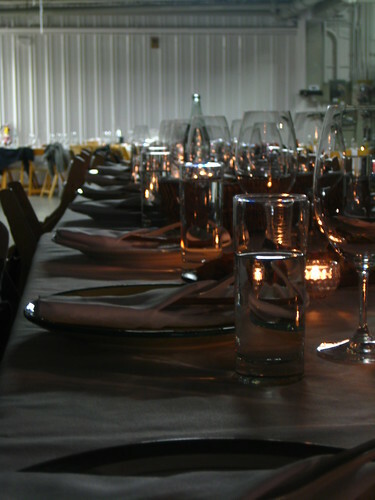 The location, a warehouse in the outskirts, was done up nicely, and the company around me were delightful. The food wasn't bad, it was above average, I was just slightly disappointed since everything seemed to be cold by the time it arrived on our table. It wasn't a $200 dinner in my mind. The best part were the Brussels Sprouts, carmelized and roasted with guanciale and ponzu fried garlic. All in all, the weekend was a success! Lots of food, samples, booze, prizes, people, I hope they'll do it all again next year. Thank you everyone at Foodbuzz, all of you are so nice, friendly, and all-around awesome. Gosh this must have been a fabulous event! Awesome! I had Mission Minis in SF recently too and liked them a lot. That ice cream looks great. Super thick and creamy. Glad it was fun.